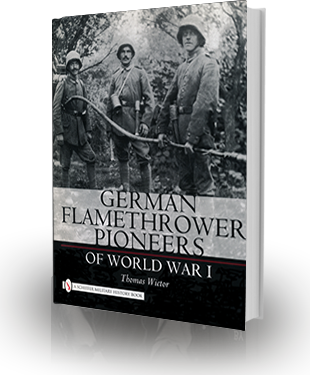 German Flamethrower Pioneers of World War I must be classified as the fundamental scientific standard reference on this subject. Based on an incredibly broad range of astonishing photo and text sources that are carefully researched, this clearly structured publication presents the development of these weapons from the first experiments in 1900 to their use in the street fighting of the 1918 November Revolution. Even the detailed descriptions of the numerous photos and illustrations reveal the author’s precise analysis and evaluation of historical documents. The attractive layout creates a well-balanced relation between text and images, making this profound study of military history an easy-to-read experience. Another excellent work from Schiffer. Schiffer’s latest release covers this little know subject and does so in their usual exemplary style. Covering fourteen chapters, the book is pretty much laid out in the chronological order of the development of the weapon and its deployment throughout the war. As with all other Schiffer books, this one is filled with tons of photographs showing the flamethrower troops in every type of environment—training, combat, relaxed poses, unit group shots and individual posed photos and quite a few photos of the flamethrowers themselves taken from various angles. I have seen many photos from World War 1, and the majority in this book have never been seen before. Additionally, the book is filled with line drawings of all the various types of equipment and their various components along with cutaway drawings of the devices and unit insignias… This is a great book.